It’s Christmas in July! Today, we’ll be making beaded Christmas socks with bicone crystals. A jewelry kit is available at DIY Jewelry Making Amazon, but we’ll be sharing you the pattern for FREE! Let’s start! 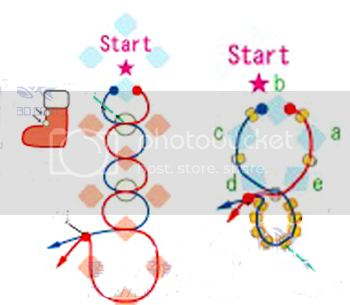 Prepare nylon thread measuring 0.8m Start with the star symbol , insert 4 pieces of 4mm white bicones into right thread , pass left thread into last bead from right thread to form a circle. Ensure beads placed at the center of the thread. 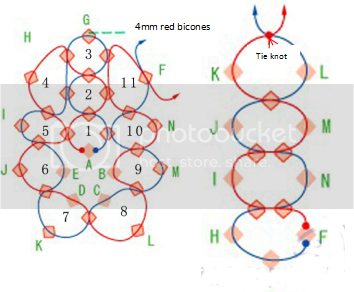 Follow the diagram and complete the weaving from 1 to 20. Do not cut off nylon thread. From step 1, continue to weave based on diagram 2. Start from point A weave till unit 11. 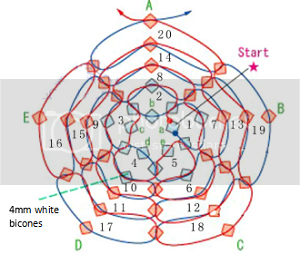 Then continue to weave based on diagram 3. Weave from bottom to top. To end, tie a knot, pass thread to a few more beads then cut off excess thread. The Christmas socks turned out really cute! Don’t they? Start making these Christmas socks in different colors. 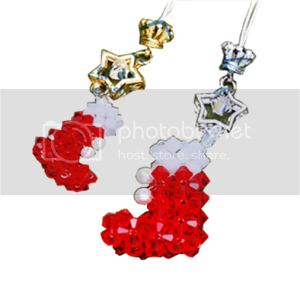 You can use it as beaded ornaments and charms. They’re really cute as mobile phone charm as well!